Tree Surgeons in Altrincham that are affordable, reliable and friendly. We are tree surgeons in Altrincham who are professional tree surgeons with a combined experience of over 30 years. We pride ourselves on being friendly and completing our work to a high standard. We are fully insured and competitively priced when compared to other tree surgeons in Altrincham so you can be rest assured that you are getting the best price possible for the job. We offer a quick response to any contact made to us so that you can get your problem fixed as soon as possible. We are City & Guilds NPTC qualified to give you peace of mind. We work fast, efficiently, but never compromise on quality. We deliver what was asked of us, and leave the area clean and tidy. We always recycle what we chop down. We quote reasonably and are open to price matching. We are professional, approachable and generally nice people to be around! When you need a tree sorting out at your home or at your workplace, we understand that it can change the way that your property looks. You therefore need someone you can trust to make it look great after we have left the job. Not only will we leave with it looking great, we are trustworthy and competitively priced. Each job can be very different and therefore needs to be quoted for individually. When we quote for a job we have to look at any buildings nearby that need to be taken into consideration and also any other surrounding plants or trees that will need to be looked after so that they are not damaged in the process. Depending on the job we will use different types of tools. Some of these tools are larger than others and therefore we will need to consider how easy it will be to get to the tree or hedge in question in order to do the job. We look at items such as narrow alleyways, walls and any other potential obstructions. Each tree surgeon will charge within their own pricing ranges but here at Elm House Tree Services we put our best quote forward first. The costs below should give you a rough idea as to how much we charge for different jobs but please remember we will need to come and quote for your job individually. 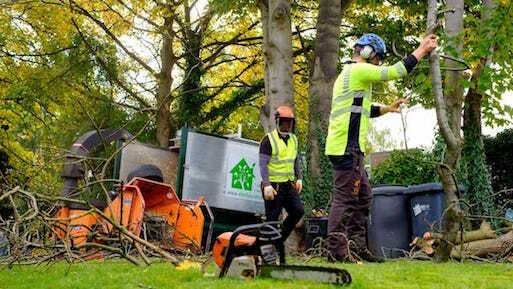 Tree Removal – this is normally around £100+VAT. It can be more if the job is quite large and complicated. Our blog post “How Much It Costs To Remove A Tree” will give you some examples of how much we charge and what you can roughly expect from us. Hedge Trimming Or Removal – this can vary from £90+VAT. Check out our post “How Much It Costs To Remove Or Trim A Hedge” to find out what factors we take into account when quoting. Our tree surgeons do come to Altrincham regularly so we will be able to come and quote you up quickly so that you are not waiting to get the job done. We are City & Guilds qualified and are very safety conscious. We have completed many courses to ensure that all of the staff here are both knowledgable and also carry out safe practices. We are trained in species of trees and hedges so that we remove in an appropriate fashion or trim in a way that will not damage the plant or tree for life. If you are thinking of having some trimming done we will advise as to when it is best in the year to do the work so that it comes to no harm. If you are looking for a full removal we are also experts in doing a removal so that it will not return in future! We will arrive at your house or commercial property on time and with all the gear ready for the job. We are respectful of your space and are therefore friendly, approachable and will do our best to keep our noisy work to a minimum where possible. We like a good chat and therefore we always keep in touch. We always answer phone calls, emails and texts in a timely manner so you know exactly what is happening with your job. You can get in touch at any time – before, during or after the job. We hope this sounds just up your street so why not get in touch with our friendly Altrincham tree surgeons now! What to do next – looking for a tree surgeon in Manchester area? We also serve areas outside of Altrincham.